DONETSK, Ukraine – The beautiful weather stands in sharp contrast to the desperation rising in Donetsk, a place that neither Russia nor Ukraine seem to really want anymore. 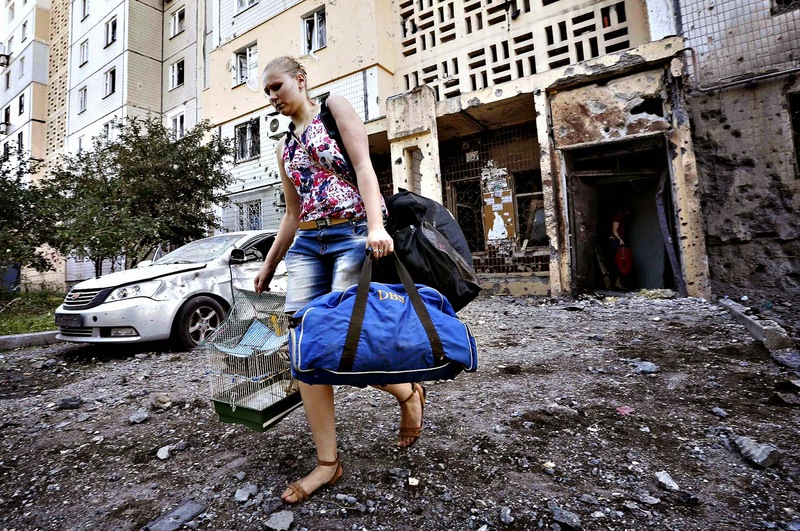 A woman walks out of a damaged Donetsk multi-storey block of flats carrying her belongings. And some Ukrainians, as they wait by the hundreds daily to clear the last Ukrainian checkpoint before entering separatist-controlled territory, feel unwanted. A woman named Irina, too afraid to be identified because of the fighting, is so fed up that she is on neither side. "Everybody suffers from the situation. Donetsk is a gorgeous city, especially during this time of year. It should stop, but unfortunately it won’t," she said. The Russian strategy now in Ukraine seems to be one of destruction, not acquisition anymore. Russian-backed fighters shelled the coke factory in Avdiivka, idling the top employer in the Ukrainian-controlled city. In much of the rest of the Donbas that Russia or its proxies control, there seems to be a recognition that, unlike Crimea, the Kremlin doesn't want to absorb territories from more than 1 million people have fled. The cost for Russia to control Donbas seems high and ineffective, especially if it is unable to go the distance and create a southeastern land bridge to annexed Crimea. Ukraine also doesn’t appear to want the Donbas anymore, at least not now, as it has imposed strict border controls. The Ukrainian strategy seems to be containment, not re-acquisition. A separatist press officer, who refused to be identified because she is not authorized to speak publicly, said that Donetsk will never be part of Russia because of the high costs of reconstruction after more than a year of warfare. And, she said, the Kremlin wants to avoid stiffer economic sanctions that would come with acquiring more Ukrainian territory illegally. She said that the separatist areas will always be part of Ukraine, though with our special status. There will be regional elections in the end of this year. For Ukraine that means that we’re going to legitimately elect our officials. We’ve already done that, though. Nonetheless, for now, Russia and only a few other countries only recognize our officials. We’ll see what happens by the end of this year. Donetsk is trying to acquire the trappings of a separate country. The rulers have opened their own bank – the Donetsk Central Bank – and taking over the Ukrainian ATB supermarket chain. Another supermarket chain, Brusnichka, shut down recently, some say for tax reasons. The separatists seized one branch of Privat Bank and nationalized it, so customers can collect money without going to Ukrainian territory. It pays out in Russian rubles, however. The separatists are also collecting taxes, even from those who work outside the areas that the Russians control. That's a lot of people because the separatist-controlled territories don't have a lot of jobs. It's not clear how tax collection is working. On receipts, the amount for taxes is always 0.00 hryvnia or rubles. How and where people pay taxes is sketchy. Commerce does take place however, in street goods and from small kiosks. However, picture-taking was not welcome at a recent market, where the merchant shouted: "Who are you and what are you doing? Are you from the tax authorities? The divide between the have and the have-nots is clearer. Young people gather in the entertainment area near Pushkin Boulevard while expensive cars pull over with young people who hang out in expensive cafes and restaurant. Where the money comes is treated as a secret by many of them. Others, meanwhile, are simply struggling to get enough to eat. For 69-year-old Valentina, a former professor of the Donetsk Polytechnic University, her pension in rubles is not enough to cover her living costs. She begs for money while walking her dog. "I worked 43 years at the university. I cannot live my life, as I wanted it," she said. "Now I have to beg for money,’ she said, pointing to the destroyed roof of a nearby building. ‘I could never have imagined that something like this would happen in my life. I don’t know if it will become better, but I pray to God it will."